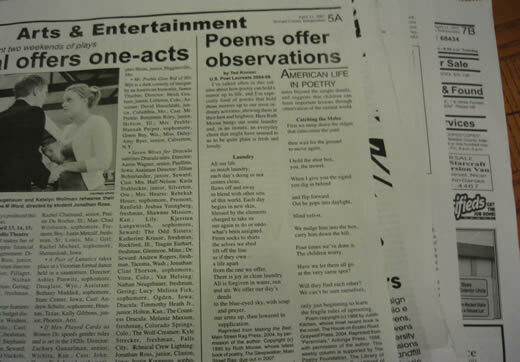 Our little once-weekly newspaper has a little poetry section in it that Ted Kooser (Mr. Laureate to you) ‘hosts’ He picks two poems from all ’round the nation and prints them, with permission. I don’t have permission and I’m doing it anyway. There have been a couple that I regret not keeping, because now my feeble memory can’t even remember what they were about – just that they were awesome. then wait for the ground to move again. I hold the shoe box, you, the trowel. We nudge him into the box, carry him down the hill. Four times we’ve done it. The children worry. Have we let them all go at the very same spot? only just beginning to learn the fragile rules of uprooting. Moles are horrible pests and should be eliminated! I would probably choose poison for that occasion. Or Cricket. She kills moles, doesn’t she, Lauren? Yes, I know your dirty secret. You try to sound empathetic toward moles, but your cat KILLS them! No, no, no -- voles. Cricket kills voles. They’re like tiny little moles -- mouse-sized. Don’t bother fact-checking it. I’m totally right. That’s for Brad, right? I post only kindly poems about the pitiful moles. Cricket is the killer in our household. Cricket.